Two alien spaceships battle over Jackson, Missouri. Their dogfight eventually brings both of them down. The military is quick to the scene and not willing to take any chances. It's shoot and kill on sight. Life readings from within one of the crashed ships draws orders to annihilate the wreckage. As an Apache lets fly two Hellfire missiles, Superman zooms in and stops the attack. It turns out that the being from which the life readings are coming isn't in any way able to harm the soldiers. It's an infant, and though harmless, she is more than just a delicate baby. Nearby a dying alien begs Superman to protect the child, for she is a princess and there are others on their way to kill her. 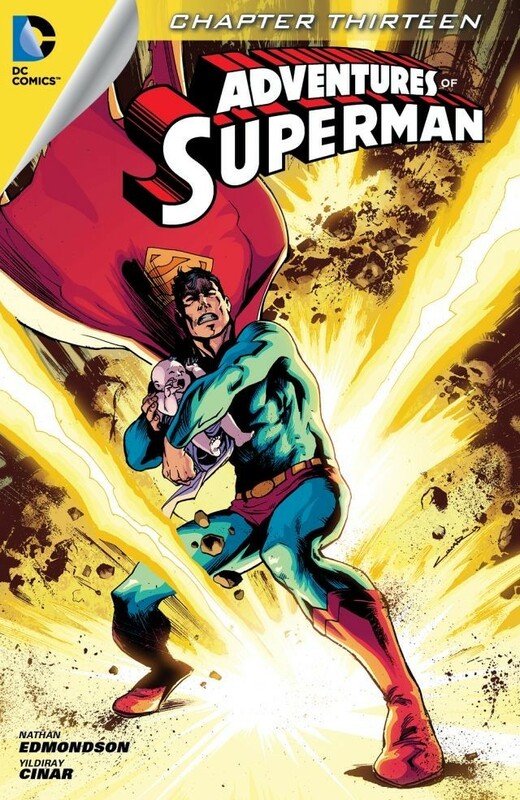 Images of the infant and her expiring protector making their escape from a distant planet suddenly rush through Superman's head, seemingly projected into his consciousness by the infant herself. Those bent on killing the child soon arrive and a chase ensues. Superman loses the attackers and does his best to keep the baby quiet and comfortable. It may be in vain, though, as the pursuers are not willing to give up, and they are drawing near. They can try all they like to take the baby, but the Man of Steel will do everything in his incredible power to protect her. Story - 3: If it weren't for Superman singing a nursery rhyme, this first part of "Infant in Arms" would have been an entirely dull read. Fortunately, that little scene of Superman swaddling the baby in the forest and singing 'Ladybug, Ladybug' struck a perfect note at the perfect time. It was also endearing to see Superman not really sure how to take care of the orphaned infant. He tries his best though, and does a decent job. He is Superman, after all. The rest of the story drags its knuckles. The military is especially full of a bunch of nitwits. Shoot and kill on sight? Now, I'm not a military man. I'm thankful for the sacrifices of soldiers, especially of my grandfather's generation, but I'm often skeptical and weary of the orders given by more powerful men that soldiers have to carry out. In this story, however, they all come off as a band of blockheads. What kind of man in power would order the death of anything without first investigating? A half-wit, that's who, and it was frustratingly uncomfortable to read such a cowardly idiotic scene. Perhaps that was the point, and the one soldier spewing, "We have to kill what ever is in there before it hurts us" was designed to drive me nuts. It could very well have been a commentary on military actions on citizens in recent years that have been questionable. There's still a lot to explore in this story. Come to think of it, we still have everything to explore. Nothing has been revealed. Who's this kid? Who are the goons chasing her? And why is Superman so quick to assume that the child is on Team Goodness? That's a twist I'd like to see: the child is actually a super-powered Eater of Worlds who is able to use her psychic powers to devour the lives of everything on the planet. Superman saved her and now has to deal with the existence of a remarkably deadly being that also happens to be an infant. I'm pining for Superman to be confronted by tougher decisions with more critical consequences. Art - 4: The art hits some nice highs. I'm especially fond of the streak drawn behind Supes as he flies. That isn't utilized much these days but it's something I've loved since I was a snotty-nosed youngster. When I was too young to read comic books, I'd spend a long time just looking at the art. That crimson blur that trailed Superman so often in the '80s was a centerpiece of my early adoration for Superman comic books. I'd trace it with my finger while making a swooshing sound. You can't quite do that with digital unless you want to change the guided-view of the screen. Out of necessity, I'm entirely digital in my comic book purchases these days, and I wholly support it, but those simple streaks brought back some fond memories and made me miss the feel of a comic book in my hands. Cover Art - 4: There's a nice feel to this cover. It follows the contents of the story itself and is nicely rendered. It shows the sense of urgency that the story genuinely tries to convey.